Congratulations to the winner of the AGMET Austin Bourke Bronze medal, Pooja Sharma. The Austin Bourke Bronze Medal is presented for a recent significant contribution to Irish agrometeorology, applied environmental meteorology, biometeorology or a related discipline. From the nominations received an award committee deemed Pooja’s work in the area “System modelling and life cycle assessment of dairy farms on heavy wet soils” most deserving of the award. 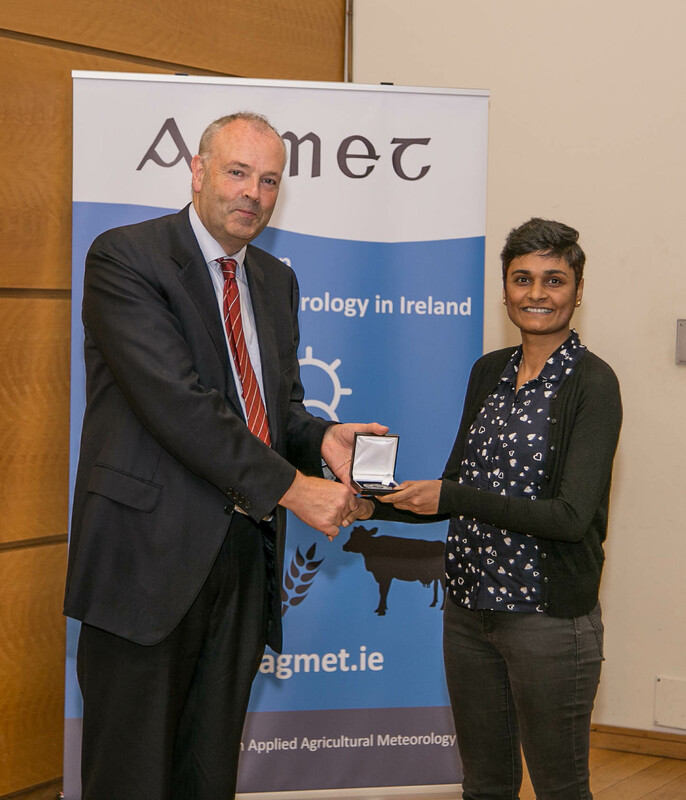 Aft er giving a summary of her winner research at the Inaugural Tom Keane AGMET Lecture event, Pooja was presented with the Bronze Medal by Met Éireann’s Head of Forecast Division Gerald Fleming. Our congratulations to Pooja and her supervisors, we wish her the very best in her future agrometeorological research.